The West Asian region has been under a political turmoil for quite a long time. Syria, Iraq, Isreal etc are some of the regions which are constantly in news for many reasons. 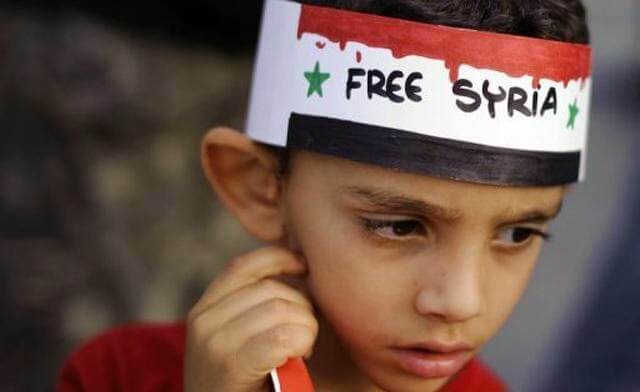 In this post, let’s analyse the Syrian Crisis – its background, reasons and the way ahead. 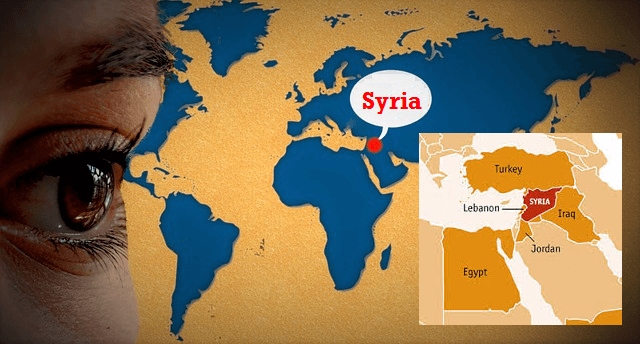 Syria is a west Asian Country bordering Lebanon, Turkey, Iraq, Jordan, and Israel. The civil war in Syria is regarded as the most brutal conflict in the world which started off in 2011 and is still on. The primary reasons for the unrest in Syria can be summarized as below. The root of this conflict can be traced to sectarian conflicts in the region existing there for centuries. Shia Islam and Sunni Islam are the two major denominations of Islam Religion. With Saudi Arabia regarding itself as the leader of Sunni Muslims and Iran as the protector of Shia Muslims, the West Asian region is divided under these two leaders. Saudi and Iran started playing an important role in the geopolitical conflicts in the region. Along with this, the absence of an accountable and democratic Government. In most of the west Asian Countries created discontent among the citizens. A democratic movement against the authoritarian Government started in Tunisia in 2011 popularly known as ‘Arab Spring’ or ‘The Jasmine revolution’. This inspired other countries in the region to raise their voice against their Governments. Syria has a very narrow belt of coastline along the Mediterranean Sea and rest of the country is subjected to extreme temperatures that cause frequent dust storms and periodic droughts. The devastating drought between 2006 to 2011, caused much resentment among the people due to poverty and unemployment. That time Syria was ruled by Basher-Al-Assad, he announced several plans like salary revisions to appease the people of his country. The largest religious group in Syria is the Sunni Muslims which constitutes almost 74% of the population. They were not happy with the administration of President Basher-Al-Assad who was more inclined to Shia Muslims. In 2011, peaceful democratic protests started in The Government started a brutal crackdown on rebel groups with the support of Iran-backed Militia and it revealed the sectarian tensions in Syria. The Sunni-dominated opposition has, meanwhile, attracted varying degrees of support from its international backers – Turkey, Saudi Arabia, Qatar, and Jordan, along with the US, UK, and France. A large number of Syrian Sunnis, US sponsored western fighters and Saudi-backed Sunni fighters etc joined the rebel group to topple the Assad regime. In 2013, US claimed that Syrian Government has used Chemical weapons (Sarin Gas) against the rebel group and demanded UN investigation in Syria. Also, US stepped up its support for rebels and the Assad regime started receding. Syria agreed to a Russian( Russia backs Assad Regime) Proposal to give up Chemical weapons and later OPCW (Organisation of Prohibition of Chemical Weapons) announced that Syrian Government has destroyed all its declared chemical weapons mixing, filling and production facilities. Hereafter, UN kick-started the peace talks with the aim of ending the Syrian Civil War. 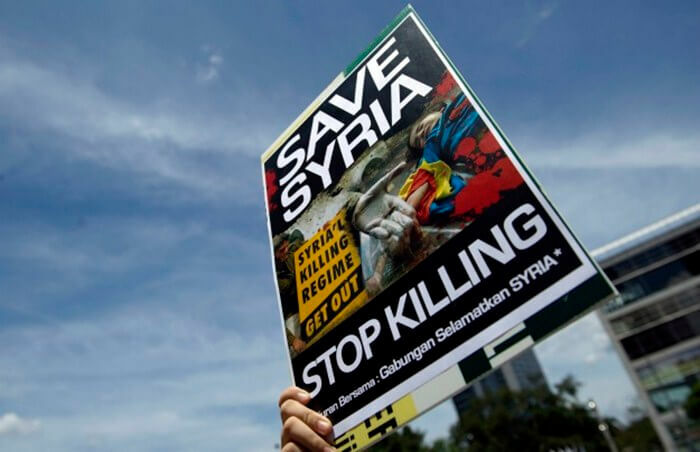 United Nations-backed international peace conference on the future of Syria known as Geneva II Conference was held in 2013, nevertheless, it remained inconclusive. The US and its allies’ supports to the rebels in Syria to topple the Assad regime, led to the rise of the terrorist outfit ISIS (Islamic State of Iraq and Syria) which established in Sunni Provinces of Iraq and eastern provinces of Syria. This radical Islamist group has gained control over vast territory and populations of Syria. ISIS became a global threat and in response to this, the US-led coalition launched air strikes on Syria in an effort to “degrade and ultimately destroy” IS. But the coalition has avoided attacks that might benefit Assad’s forces. In short, it could not destroy the might of ISIS. The balance of Power changed when Russia began an air campaign targeting “terrorists” in Syria in 2015. With the support of Russia, Assad regime regained many parts of the country including Aleppo City. But opposition activists said that its strikes have mostly killed Western-backed rebels and civilians. The Geneva III peace talks are still on, but the peace still remains. The devastating civil war has set the country decades behind in terms of economic, social and human development. Syria’s GDP today is less than half of what it was before the war started and it could take two decades or more for the country to return to its pre-conflict GDP levels. Most of the people in the region are living below poverty line. More than 250,000 Syrians have lost their lives in five years of armed conflict, millions of innocent people have got injured in the conflict and 80% of the children are harmed by the civil war. Large-scale human displacement from Syria has resulted in Global Refugee Crisis. Approximately 6.5 million people are internally displaced inside Syria, 1.2 million were driven from their homes in 2015 alone. Widespread damage to physical infrastructures such as roads, bridges, schools, power generation, and water supply. Reconstructing damaged physical infrastructure will be a monumental task. India has had good relations with Syria historically, but India has always taken a neutral stand to Assad’s regime. India has a substantial interest in the field of trade and investment, Diaspora, remittances, and energy security in the region. 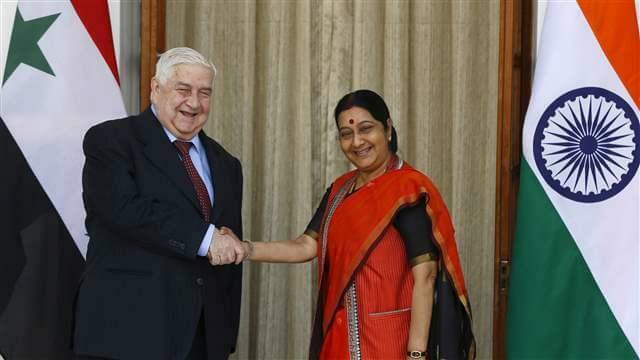 Due to the Syrian Crisis, India had to abandon its oil investments in Syria. Though India has not much dependency on Syria for her energy needs, the political stability in the entire West Asian region is very important for India. More than 7 million Indians are working in these countries and therefore the stability of the region should be India’s priority. Recently India abstained from voting on a United Nations General Assembly resolution demanding an immediate ceasefire in Syria. By doing so India was trying to balance both US and Russia. However, as India work towards a permanent seat in UN Security Council, India should deviate from its path of non-alignment and should take a decisive stand on global affairs like Syrian Crisis. The outside powers that are involved in Syria’s civil war through proxy means need to reconsider their decision. Their role in converting a peaceful democratic movement into full-fledged war should be condemned. They should stop financing the extremist groups to avoid further conflicts in the region. The two major powers US and USSR, instead of reviving a cold war era, should engage in constructive negotiations with the Syrian government to find an amicable They should provide support to establish a democratically elected Government. The Syrian government should be ready for a dialogue on Syria’s future with the non-jihadist opposition groups. Considering the large scale devastation which happened in Syria, rebuilding it’s human and social capital will be an insurmountable task for the govt. Therefore the international community should come forward with a helping hand to bring the war-torn nation into normalcy. India can also play a constructive humanitarian role to establish peace and stability in the region. @Pramodh: Happy to help :-). If possible please provide a comprehensive article about Israel-Palestinian issue. @Akash: Great to know that the article helped. We will come up with a comprehensive article about Isreal-Palestine soon. @Kapil: Thank you for the positive feedback. Thanks team..comprehensive article with much needed insights on current issues. Great to see that serious aspirants like you recognise the value of good study materials. your articles are really praiseworthy….. Very effective….can you provide an article on India-china war?? Thanks clearias.com, keep it up! Really it was very important information. Great to hear that. Aspirants like you are our motivation. Simple n modatst way the article help us to understand Syrian crisis thanks a lot .